This week Alan Taylor posted some more amazing historical photos from the NYC Municipal Archive’s recently digitized collection. Among them, an impressive 1940s panoramic view of West St, which is stitched together from several photos taken from different vantage points. It’s very carefully done, but the distortions and cropping in the [less important?] foreground give it that awesome Street View flavor we’ve come to know and love. The Atlantic is also hosting a full-size, 5,424-pixel version of the pano, which, I’m jealous, because they somehow managed to register a user account with the NYMA to get larger images. And this matters to me because this photo I stumbled across is both great and small. There’s not much metadata about it, but it’s clearly a rephotograph of a contact print of an earlier [1932? 1937?] 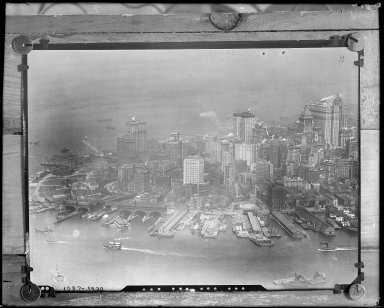 aerial view of lower Manhattan, tacked onto a crate or something. It reminds me of those rephotographs Carleton Watkins did of his earlier images that Tyler discussed a couple of months ago. It makes me want to see what else the archivists were rephotographing, but alas, that tag wouldn’t be invented for 40 more years.